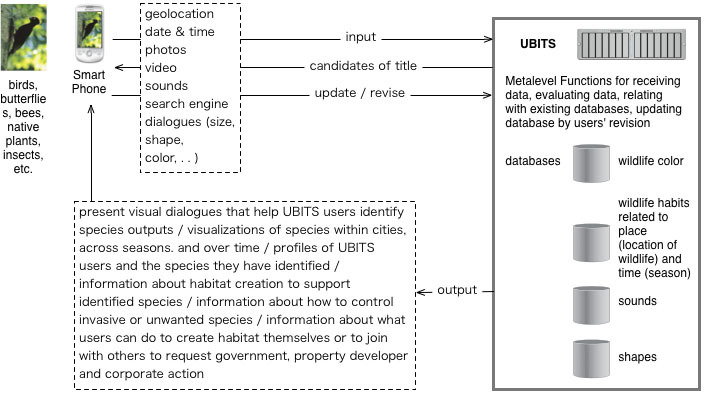 Takahashi Yusuke, a database expert with a Keio PhD, and I created a poster for the URBIO conference last month introducing a mobile app for city residents to monitor and promote urban wildlife. In brief, our mobile app entitled UBITS (Urban Biodiversity Identification and Tracking System) allows school children, bird watchers, gardeners, hobbyists, and amateur naturalists use their mobile phones to capture images, sounds and locations of birds, butterflies, bees, insects, trees, and other plant life; query multiple databases to identify wildlife and plant species; participate in collaborative mapping of urban species by location, frequency and time of year; and increase habitat for urban biodiversity. The project is at concept stage, and it would be great to find a start-up, corporation or university that can fund a working prototype and launch this application for iPhone or Android. Participatory science that promotes increased habitat provides an excellent branding opportunity, educational tool, and new way to bring nature to the city. This blackberry bush, supported by plastic poles and rope, remind me of my friend Chris Berthelsen’s amazing Fixes blog. It has all the classic elements: use of public space in unexpected way, display of citizens’ care and skills, recycling of simple materials to make something useful and wonderous. This is one of my favorite neighborhood gardens. In the past, she has grown rice in a bucket, gorgeous peonies, cymbidium orchids, tulips, roses, hydrangea, and geraniums. Before the rainy season and summer heat, I took a few day trips in Tokyo. One of the more remarkable places is Yumenoshima (夢の島), which means Dream Island. It was begun in the 1960s as a place to store huge amounts of garbage by creating a large island in Tokyo Bay. Today it has an enormous incinerator, spectacular greenhouse for plants, a gym, a marina, and some overgrown park areas. Of the palms I recognized the Canary Island palm, and what look like Mediterranean palms. Mostly deserted excepted for a few people going to the gym and cut off from the city by freeways, the park is large and somewhat mysterious. I love how the area around the incinerator and marina are full of surveillance video cameras and speakers everywhere playing muzak. The new leaves on the shrubs in my satoyama box have wonderful graphic and colorful early summer leaves. The two 5bai midori satoyama boxes have been beautiful last fall, over the winter, spring, and now early summer. Despite their compact sizes (20 cm square and 15 by 30 cm rectangle), they are able to support a lot of plant growth, density, and variety. 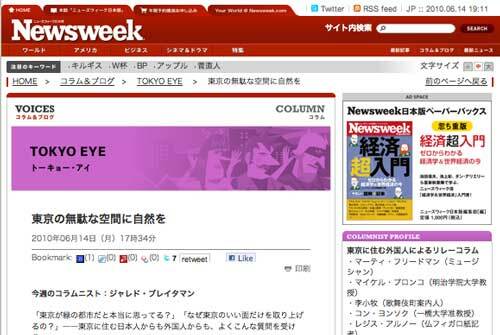 Newsweek Japan published in Japanese a version of my Dead Space article. Please see my article in the Huffington Post for a (slightly longer) English version. Most people think of Harajuku as being either luxury fashion or teen hipsters. But plenty of Harajuku is comprised of small streets, old houses, and long-term residents. I like how this garden is created entirely from flower pots lifted just off the street and hanging from the cinder block wall. That’s a lot of flowers for one tiny space. 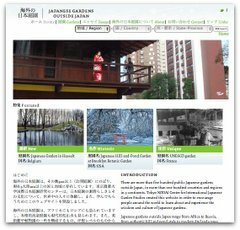 A few weeks ago I took a long, rambling walk with Chris Berthelsen, author of the amazing blog Fixes which “investigates alterations of space/objects at the public/private boundary in suburban Tokyo.” I love his close observations, unlimited curiosity, and attention to materials and human effort and satisfaction. The goal of our walk was to explore an area neither of us knew and attempt to get lost. In addition to some inventive fixes at a tiny park, we saw many beautiful gardens in Higashi Nakano. I love how the garden in the photo above focuses almost entirely on cymbidium orchids and clivia. Also noteworthy are the re-use of cinder blocks, the shelf that provides space for another level of plants, and the care in providing beauty at the edge between private and public space. Another garden uses the two sides of a house to create a complex perennial garden using flower pots. Great variety of texture, color, and plant variety. I can only imagine how much more beautiful the garden would be if it were planted in the soil, and allowed to grow so much bigger. I certainly would have missed this small garden below where both plants and bikes are tied with string to the window grate. It’s great to see that no space is wasted, and that multiple functions can be supported despite all constraints. And lastly, I found this small, unpaved lane to be incredibly charming. The stick and bamboo fence, the line of trees and shrubs, the materiality of the soil all made me imagine that we were in a small country town, not two kilometers from the Shinjuku skyscrapers. There are still areas that seem wild within the center of Tokyo.